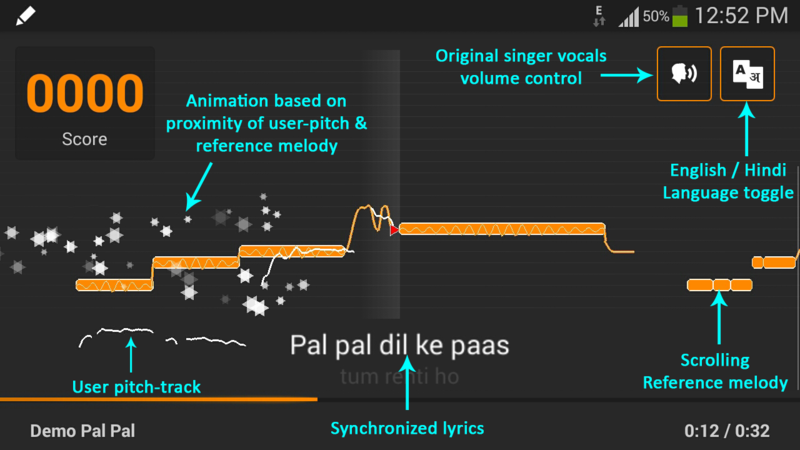 SensiBol's singing interface provides a highly immersive singing experience. It is available to third parties as an easy-to-integrate package (SDK) and as a Cordova plugin, which can be used to build stand-alone singing-driven applications or integrate into an existing music application. The interface is highly customizable and is available as a white-labeled solution. It is available on iOS, Android, Web, Desktop (Windows & Mac) and IVR. The Singing interface SDK supports various functions and is completely customizable for a specific use-case as per the client’s requirements. It is available in both landscape and portrait modes. The Singing Interface can be used for various scenarios such as increasing audience-engagement, singing auditions and contests, music education, music-related promotional activity, and Mobile/Web/Live Karaoke. SensiBol also provides Metadata extraction & Karaoke/minus-1 track production services required for the Singing interface to function. The singing interface SDK has been deployed for multiple use-cases including music learning, social karaoke, singing contests and brand-engagement.